Originally known as Canoe Place, the town’s name was changed to Port Allegany in 1838. The town, which is 30 miles from the headwaters of the Allegheny River, was developed as a port on the Allegheny River. This is where Native Americans and early pioneers would stop to build or repair canoes before traveling on the river. Port Allegany is best known for its glass manufacturing. Pittsburgh Corning Corporation constructed its first plant in Port Allegany in 1937. 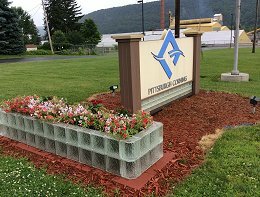 Glass blocks, used in a variety of building, applications, are still proudly made in America, right here in the community of Port Allegany. 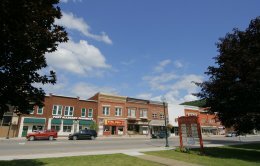 The downtown, located along scenic Pennsylvania Route 6, features an attractive town square with a picturesque gazebo. During the summer, on Thursday nights, free Town Square Concerts featuring live musical entertainment are offered for the enjoyment of residents and visitors. Today, the river attracts visitors who enjoy kayaking, canoeing and fishing. Froggy Bottom Allegheny River Outfitters can provide everything you need to hit the water. A variety of restaurants, family run hotels, and a charming bed & breakfast, The Inn on Maple Street provide visitors a chance to relax and enjoy the charms of this small town located along scenic Route 6. For additional information on relocating or starting a business, please contact the Port Allegany Economic Development Corporation at the Port Allegany Borough: 814-642-2526.